Ana Lucia Chaverria receives a scholarship check from John L. Lemkan of the New York Mercantile Exchange after winning the NYMEX Open Outcry Competition. 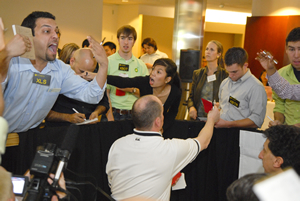 HOUSTON, TX, April 28, 2008 – UH C. T. Bauer College of Business showed their market savvy at the NYMEX Open Outcry Competition on April 18-19, 2008. Of 75 competitors from universities in Texas and Oklahoma, some on the graduate level, Bauer College of Business undergraduate students Ana Lucia Chaverria and Rieza Marukot took first and second place respectively. Seven out of 17 finalist positions went to Bauer College students as well. The competition was held in Melcher Hall on the University of Houston campus, home to Bauer College, and coordinated by members of the Finance Association, a student organization at Bauer. Twenty-two companies, including ConocoPhillips, Merril Lynch Commodities and Shell, helped to sponsor the competition. Bauer College has hosted the intense, high-stakes NYMEX Open Outcry Competition for the past four years. For the past four years, the event has been a Bauer College mainstay. The outcry is an intense simulated trade competition with two phases – in the first phase, participants worked in groups and did table trading. Out of 29 teams from 22 universities, the graduate team from Bauer placed 12th, and the undergraduate team placed 14th. The second phase centers on the age-old method of “open outcry,” using shouting and hand gestures to buy and sell stocks. Students must also adapt to news information that may change the price of the stocks. “The open outcry session was very competitive. These concentrated trading rounds mirrored the crude oil futures pit on the NYMEX during the Gulf Wars,” said Brad Banky, vice president for financial trading at Shell. Corporate representatives were impressed with the high level of skill demonstrated by Bauer students, as well as the amount of preparation put in by Finance Association members who organized a panel discussion that preceded the competition, Banky said. Ten panelists from companies including NYMEX, Shell and BP answered questions from outcry participants. The experience of learning from industry professionals and putting those skills to use was valuable for competition winner Chaverria, who said the competition was the best experience she had in college. She added that went in with no expectations but wanted to do better than she did in 2006 when she placed 4th. Last year, a Bauer student claimed the top spot as well. Finance and accounting graduate Saeeda Jamaluddin (’07) placed first and received a coveted, all expenses paid internship with NYMEX in New York. 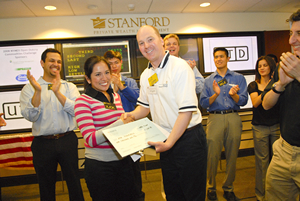 She is now part of the trading team with ConocoPhillips and attended this year’s trading competition.